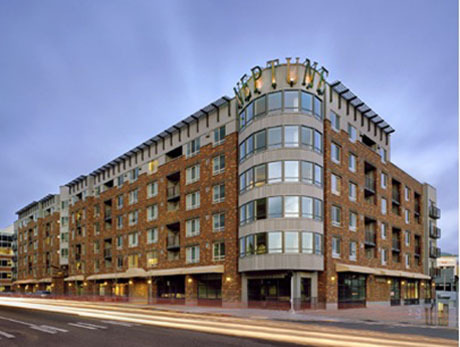 The Neptune is a 234-unit luxury apartment building in the South Lake Union area. It includes units from studios to two bedrooms plus dens. There is approximately 17,000 s.f. of tenant space. Parking for 329 cars is provided in two sub-levels under the building. Among the features of the Neptune are a leasing office space, a conference room and a business center. Recreation areas are also provided, including a theater, games areas, billiards, kitchen facilities, a fireplace lounge, and a fitness center. The construction of the building is structural steel studs and spanning composite steel and concrete deck over a concrete frame. The exterior is brick veneer, metal siding, and vinyl siding. The building, due to height was required to have a smoke control system, and required an emergency generator. There was also a significant amount of utility work and SDOT work along the Dexter elevation which was coordinated and executed. Retail distribution was provided for, on both the east and west elevations of the building.